This month's LuxePineapple Post theme is Natural Beauty. I'm a huge fan of these finds because they're really guilt-free beauty! Many products contain so many unfamiliar ingredients that we may not know what's being put on our skin. These natural products can be enjoyed knowing they're made with quality, natural ingredients without sacrificing performance. Let's take a look. Eco-Armour Insect Repellent | $19 | As a mom of a toddler with ultra-sensitive skin, I really appreciated this product this month! Typical bug sprays are filled with nasty chemicals and feel horrible on the skin. Natural alternatives aren't easy to find so I'm really thankful to LuxePineapple for introducing me to a new brand. This is definitely earning a permanent place in the diaper bag! Let's Put A Bird On It Unicorn Dust Highlighting Cream | $9 | This highlighter is SO pretty. And the texture is amazing, it's so silky and easy to blend. It took no effort to swatch and glide on the skin. I'm looking forward to using this in the cooler months for a luminous glow. Live Beautifully Lip Glitz & Travel Size Deodorant | $8 & $4 | This is another brand I'm glad LuxePineapple introduced me to. Oddly enough, the deodorant was my favorite discovery this month! Subscribers received a Lip Glitz in Ruby Slippers and travel size deodorant. The Lip Glitz is a beautiful red hue for fall and contains no parabens, sulfates, phthalates, or synthetic preservatives or fragrances. The deodorant is definitely the best smelling deodorant I've ever had. It's a sweet, fresh mix of blueberry and violet and I can't get enough. It even helps improve the condition of skin and reduce razor bumps! 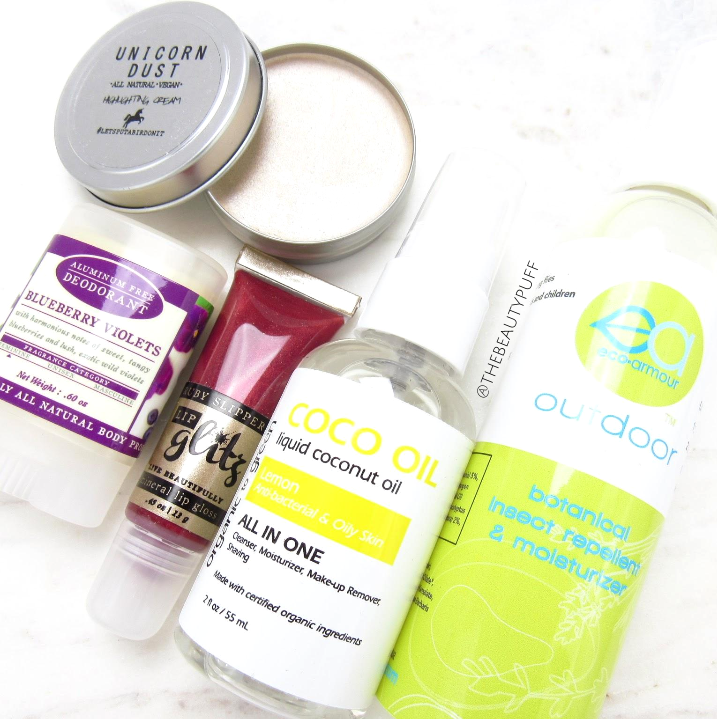 Organic to Green Liquid Coconut Oil | $10 | This multi-tasker is perfect for fall. It can be used as a cleanser, makeup remover, or moisturizer. I love using it to remove eye makeup and as an extra nourishing moisturizer when I have particularly dry skin. My skin is already starting to get dry patches and fall weather has barely begun. This arrived just in time! Subscribe to LuxePineapple post for $24/mo. NEW subscribers save $5 off your first box with the code THEBEAUTYPUFF.